What happens when +30 of the nation’s premier data-driven programs come together to show what works? The greatest social innovation “science fair” imaginable! 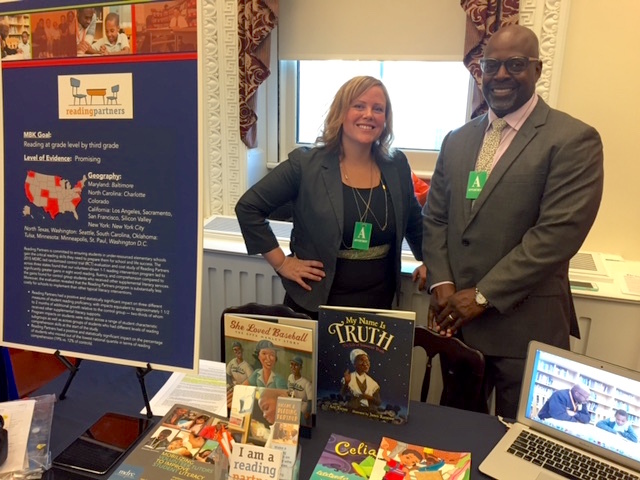 On October 17, the My Brother’s Keeper (MBK) initiative invited a range of leaders in social innovation to take part in a What Works Showcase at the White House. Reading Partners was selected as one of five organizations and educational interventions to present an evidence-based approach to helping kids read on grade level by third grade. The event demonstrated the value and importance of using proven tools and approaches to address persistent opportunity gaps faced by boys and young men of color—approaches that have the ability to transform the way we deliver social services and, in turn, transform lives in more meaningful ways. It is for these reasons that there has been no higher priority for the President than to help at-risk and vulnerable families access ladders to economic opportunity, equality, and justice. So far, the MBK initiative has shown great promise. Beyond getting young men excited about mentorship by pairing President Obama with NBA All-Star Steph Curry to make one of the coolest promotional videos of 2016, the initiative has observed progress on local and national levels as outlined in the 2016 MBK Progress Report. In addition, high school graduation rates just reached a record high of 83 percent under the Obama administration. But there is still work to be done. For a black male, graduating from college promises to change his life’s trajectory. But, achieving college graduation starts in the early years of childhood. Today, 86 percent of black boys and 82 percent of Hispanic boys are reading below proficiency levels by the fourth grade, according to the National Assessment of Educational Progress (NAEP). And data shows that young men who aren’t reading at grade level by third grade are at higher risk of high school drop-out. For these reasons, reading at grade level by third grade is one of the seven pillars of the MBK initiative, and one that Reading Partners is working to address in 14 regions across the country. During the What Works Showcase, Reading Partners representatives; Karen Gardner, executive director, Reading Partners Washington, DC and Dean Elson, chief knowledge officer, were joined by tutor-student pair William Harrison and Zyree to demonstrate the program’s community-driven approach to providing effective, evidence-based literacy tutoring. At the heart of what works for Reading Partners are the dynamic pairs of passionate community volunteers and motivated students: What drives results is the research-validated program. Even with a gold-standard evaluation study that proves Reading Partners works, the organization has continued to evolve its program to serve more of its target students earlier in their school careers and improve its approach to create greater impacts. For example, recent results have shown that 89 percent of Reading Partners’ kindergarten through second grade students mastered the key foundational skills needed to read at grade level. Chief knowledge officer, Dean Elson, has helped establish high standards for research and evaluation at Reading Partners—an effort made possible in-part by the Social Innovation Fund. “Reading Partners is proud to be a recipient of two Social Innovation Fund (SIF) grant awards and has used the SIF experience to rigorously evaluate the impact of our program and gain important insights from the implementation fidelity data that have been collected,” said Dean. The Reading Partners program is one of many intervention programs making strides to promote educational equity and justice for young males of color. To learn more about how you can become a reading partner, visit readingpartners.org/volunteer. Or, visit whitehouse.gov/my-brothers-keeper to learn more about the MBK initiative.